Yesterday we highlighted Scott Patterson’s investigative report detailing how the SEC sub-contracted out the management of its EDGAR corporate action database to data firms, who with the SEC’s knowledge and approval sold the data in tiers to – well – to all kinds of firms. Patterson’s piece was quite predictably attacked by the same predictable defenders of modern market structure. (2/8) Who, exactly, subscribes to “faster” feed? Story IDs “hedge funds,” newswires. Any evidence automated prop-trading firms subscribe? (4/8) And what’s a “mom-and-pop investor?” Doesn’t this describe pension beneficiaries whose $ managed by hedge funds getting the fast feed? (7/8) The time lag certainly merits scrutiny because the information is being released by a government entity. No doubt it’s news. (8/8) But twisting that angle into a story of evil #HFT hurting virtuous retail investors does disservice to @WSJ readers & the public. This is what happens when a technology designed to solve problems in the 1990s becomes the focus of scrutiny so many years later, said Manoj Narang, the chief executive officer of proprietary trader Tradeworx Inc. 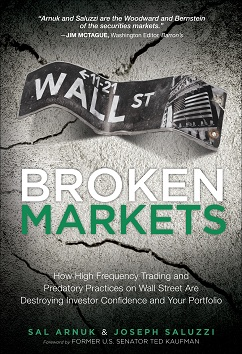 Thanks to high-frequency trading, every detail of how data is broadcast to U.S. markets is being reviewed in probes by the New York attorney general, the FBI and the SEC itself. “It’s extraordinarily likely that this is an error of oversight that’s completely unintentional,” said Narang. Batting Third, Bloomberg’s Matt Levine wrote this editorial. To be sure, the top of the order was strong: Schack – Manoj – Levine… I mean that is Kansas City Royals strong! But then Scott Patterson released more information from his investigation in a quick follow up article. It was almost as if he expected the above gentlemen to step up to the plate as they did, so that he could put on his MadBum uniform and mow them down: SEC Warned Before About Early Release Weak Spot. “The fund company had placed 250,000 shares of the stock, Intrexon Corp.XON -0.28%, a biotechnology company, into the dark pool in the afternoon of Feb. 25. At about 2:37:30 p.m. Eastern, trading suddenly picked up sharply and over the course of about 25 seconds the company sold 200,000 shares of the stock. And the mutual fund called the SEC! And the SEC declined to respond! This is very rich. It is also very sad, as the same organization that fined NYSE $5 million in September 2012 for data release inequity had been entrenched in a similar practice at the same time – and even more remarkably – afterwards… to this very day! Ok. So Scott Patterson wins the SEC EDGAR Early Release Media War. Scott Patterson is MadBum. However, today’s note is not just to inform and entertain you, or praise Scott Patterson; we think a very important side issue actually is the main issue here – the policing of liquidity pools by their owners, whether they be stock exchanges, independent dark pools, or bank-owned dark pools. We hope there is a third part to this story, and that it deals with this last point. Trading is a zero-sum game. If some savvy speedy traders picked off a mutual fund for a couple of hundred thousand dollars, then that is money that came from investors. If we have a market that relies so much on for-profit entities self-policing their sand boxes, then there has to be some line drawn which cannot be crossed. What is that line?